After my post on Bentham and sacred values on Tuesday I happened to come across this interesting video by the evolutionary biologist Tiger, which addresses a whole host of issues, many of which I have started to think seriously about of late. Firstly, I found it interesting that Tiger mentions (at the 5:20 mark), after outlining the evolutionary function of religion, that utilitarianism was a failed attempt to replace religion with a secular moral ethic. It failed, he argues, "because it didn't have have any good music [that was before my Bentham music video below! ], it had really poor costumes, and no great architecture." He makes a very good point, and I agree with him that there is a poverty of intergenerational institutions that could do for humans what religions does. Though I would want to perhaps add the proviso that the problem is no secular institutions have (as of yet) been able to provide the positive benefits that religion can confer (while avoiding the bad consequences religion also confers). I think the positive psychology movement, for example, could help fill this gap. And it might be much more successful than Bentham's hedonism. More specifically, I think a society that aspires to capitalise on what I have called the "play dividend" could deliver on these things. So if we could replace the preoccupation with religion with a preoccupation for play (social, physical, imaginative, etc.) I think things could get very exciting. Secondly, I was fascinated by Tiger's insights into male behaviour. It just so happens that I am reading this book at the moment, and have this book sitting on my shelf as my next read. My interest in the life history of males was spurred on by my interest in the evolution of patriarchy (in addition to being a father to three boys). I actually planned to post some thoughts on these issues later. So I will save that for another time. Anyways, Tiger's talk is well worth listening to. He will no doubt challenge your understanding of the world in many respects. But I think the perspective he adopts, namely the lens of evolutionary biology, is one of the most valuable perspectives we can adopt to make sense of religion, morality, patriarchy, aging, war, etc. It seems each year when I teach Bentham it stimulates some new ideas which I post about here (see here in 2010, and here in 2008). So this year is no different, as I am spending "reading week" pondering, once again, the brilliance of Bentham. Next week my intro to political theory class covers Bentham, and then Mill. As I have mentioned before on this blog, if I had only a 1 hour window to teach a class on only one moral or political thinker who I believe would have the maximum impact on improving our ability to think and act morally, it would be Bentham and his calculus of happiness. Why? Because it has the potential to help us overcome many of the cognitive biases that impede our ability to make rational and moral decisions. Over the past few weeks I have started researching the social psychology literature on the topic of "sacred values". These are values that people believe are absolute or inviolable. Sacred values are things people believe should never be subject to trade-offs with lesser, non-sacred values. I am interested in seeing how the study of sacred values might apply to political philosophy and theory, in particular, to "ideal theory" in debates about justice. "each person possesses an inviolability founded on justice that even the welfare of society as a whole cannot override"
"inequalities deriving from unchosen features of people’s circumstances are unjust"
"If you're an egalitarian, how come you’re so rich?" These different works of political philosophy are unified not only by their appeal to sacred values (typically liberty or equality, or a serial ordering of such values), but also by the methodology they employ to activate the appeal of ascribing a primacy to such values. This is typically done via abstraction and/or idealization. The theorist asks us to consider an artificially devised choice situation, one designed to reveal the "intuitive" foce of ordaining some value or values as "sacred" and inviolatible. Bentham sought to replace our reliance of intuitive appeals to "sacred" values with a secular, rational ethic. Rather than invoking fanciful or abstract thought experiments that track our most basic moral intuitions about justice or fairness, Bentham instead urges us to consider the expected consequences of our actions in the "here and now (and future)". Viewed in this light, most injustice in the world stems from the fact that our laws and customs are not premised on a rational and competent assessment of their impact on human happiness. They are based instead of unquestioned customs, religion, cognitive biases, etc. Bentham offers us a transformative secular ethic. To be a moral agent we must ponder the intensity of the pleasures or pains our actions will cause, the number of people affected by our actions, the likelihood that other pleasures or pains will be caused by our actions, etc. Tradeoffs of different kinds are thus inevitable. Responsible moral agents must realize that difficult decisions have to be made, and Bentham's calculus of happiness offers us some guidelines for thinking such decisions through. Bentham's moral ethic thus enhances our moral deliberations, it compels us to develop the complex skill-set needed to act so that we maximize pleasure and minimize pain. Whereas moral and political theories that appeal to sacred, inviolable values typically close our minds and in doing so impair our ability to think and act morally in the real world. Deontology champions the primacy of sacred values and principles, and thus it forbids entertaining the kind of deliberation required in tradeoffs ("dirty hands"). This can leave individuals and societies ill-equipped to face the tough challenges we face, whether it be balancing concerns of liberty with concerns of security, or tackling the economy, climate change or healthcare. I will have more to say about this in a future post. Of course one might reply that Bentham, and utilitarianism more generally, is just another example of a theory premised on a "sacred value"- namely, the value of happiness (or the principle of utility). I suppose that is true, at least to some extent. And that is why I prefer to endorse a pluralist ethic that makes virtue, rather than principle, the central focus of an account of justice. But I do think there is an important difference between prioritizing happiness (or welfare) and prioritizing a value like liberty or equality. I won't work out that response here, but I think it is an interesting objection, and one worth responding to. Furthermore, the nature of a good like happiness is such that it will not pre-determine which tradeoffs can be made in advance of a full consideration of the relevant facts. And that stands in contrast to the stance of someone like Rawls, who argues that "a basic liberty can be limited or denied solely for the sake of one or more other basic liberties, and never for reasons of public good or perfectionist values". So if utilitarianism is premised on a sacred value its slogan would be something like "limit utility only for the sake of more utility". And that does not strike me as inherently problematic as deonotological theories are, for it invites us to get into the devil of the details. But again, I am not trying to defend utilitarianism here. I merely wish to point to an important feature of it that I think makes it a much more attractive moral and political theory than deontological theories. So I hope you enjoy my Bentham video! And I hope to post a few more substantive things on sacred values and ideal theory in the weeks to come. A group of 99 villagers with Laron syndrome has been studied for 24 years by Dr. Jaime Guevara-Aguirre, an Ecuadorean physician and diabetes specialist. He discovered them when traveling on horseback to a roadless mountain village....As Dr. Guevara-Aguirre accumulated health data on his patients, he noticed a remarkable pattern: though cancer was frequent among people who did not have the Laron mutation, those who did have it almost never got cancer. And they never developed diabetes, even though many were obese, which often brings on the condition. ....This is where the physiology of the Laron patients links up with the longevity studies that researchers have been pursuing with laboratory animals. IGF-1 is part of an ancient signaling pathway that exists in the laboratory roundworm as well as in people. The gene that makes the receptor for IGF-1 in the roundworm is called DAF-2. And worms in which this gene is knocked out live twice as long as normal. Mutations in growth signaling pathways extend life span, as well as protect against age-dependent DNA damage in yeast and decrease insulin resistance and cancer in mice. To test their effect in humans, we monitored for 22 years Ecuadorian individuals who carry mutations in the growth hormone receptor (GHR) gene that lead to severe GHR and IGF-1 (insulin-like growth factor–1) deficiencies. We combined this information with surveys to identify the cause and age of death for individuals in this community who died before this period. The individuals with GHR deficiency exhibited only one nonlethal malignancy and no cases of diabetes, in contrast to a prevalence of 17% for cancer and 5% for diabetes in control subjects. A possible explanation for the very low incidence of cancer was suggested by in vitro studies: Serum from subjects with GHR deficiency reduced DNA breaks but increased apoptosis in human mammary epithelial cells treated with hydrogen peroxide. Serum from GHR-deficient subjects also caused reduced expression of RAS, PKA (protein kinase A), and TOR (target of rapamycin) and up-regulation of SOD2 (superoxide dismutase 2) in treated cells, changes that promote cellular protection and life-span extension in model organisms. We also observed reduced insulin concentrations (1.4 μU/ml versus 4.4 μU/ml in unaffected relatives) and a very low HOMA-IR (homeostatic model assessment–insulin resistance) index (0.34 versus 0.96 in unaffected relatives) in individuals with GHR deficiency, indicating higher insulin sensitivity, which could explain the absence of diabetes in these subjects. These results provide evidence for a role of evolutionarily conserved pathways in the control of aging and disease burden in humans. 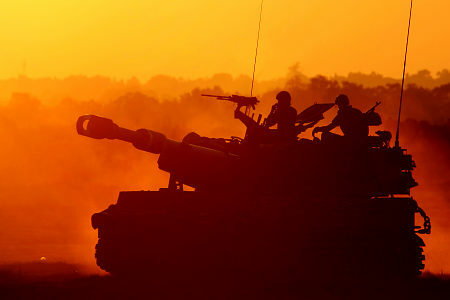 Following on from my last post about sacred values, I read with interest a news item on the Science website about this study on war as a moral imperative. The study shows that, contrary to what many might be inclined to think, support for deadly intergroup violence is bounded in deontological reasoning and parochial commitment rather than a consequentialist "cost-benefit" analysis. Critics of consequentialism often object that it is a "harsh" moral theory that fails to recognise the separateness of persons. Because consequentialism permits trade-offs it is typically characterized as a defective moral theory that fails to accord the appropriate moral weight to sacred or "serially ordered" values (to use Rawls's terminology). Decisions based on sacred values, such as whether to become a priest or a suicide bomber, often seem to follow a rule-bound logic of moral appropriateness and absolutist thinking, which, at least in a proximate sense, defies the cost-benefit calculations and means-end logic of realpolitik and the marketplace [26,27]. Even in objectively economic contexts, such as when playing one-shot economic games, people will make apparently morally motivated and personally costly decisions to obey social norms, or to punish those who do not (cf. [28,29]). In this paper, we investigate whether people choosing whether to support or participate in war use the logic of instrumental rationality (as assumed by the preponderance of scholars and policy-makers), or the logic of deontology. What I take away as the moral of the story here... there might be less war in the world if we all thought like good consequentialists rather than good deontologists! Jonathan Haidt recently gave a talk at the 2011 meeting of the Society for Personality and Social psychology entitled "The Bright Future of Post-Partisan Social Psychology". The talk was featured in this New York Times article. Haidt's talk is excellent, and brings a number of important issues to the fore: for example, the power moral intuitions (or sacred values) have over our cognition (as he puts it, "morality binds and blinds") and how close-minded academics who champion diversity and being open-minded can really be. In my lecture last night we covered Kant's "What is Enlightenment?" and his argument that political progress needs communication that is both made public as well as publicizable. The publicity requirement concerns the number of people communication can reach, and the publicizability requirement means the communication must be interpretable by others. Given the recent developments in Egypt over the past week I thought it would be useful to consider how Kant's insights might relate to current events. 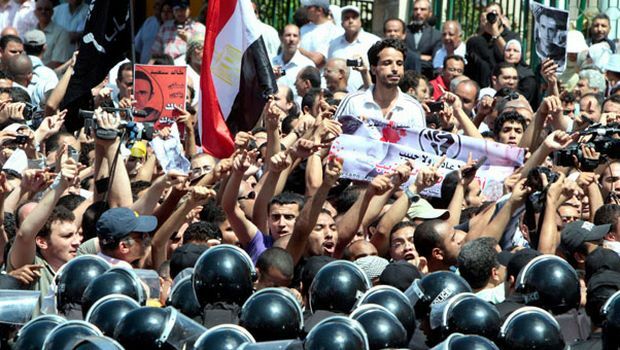 The week of protests in Egypt were sparked by a number of factors- high unemployment (9.4%), allegations of political brutality and other human rights violations. Egypt has been under martial law since 1981 when the President was assassinated. 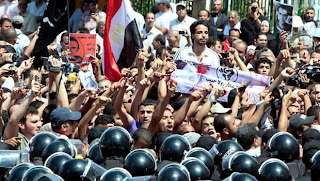 If political progress is to be made in Egypt then the push for change must be somethings others can understand. Concerns about economic hardships and human rights violations would meet these requirements. However, there are many different groups pushing for change (including religious extremists), and so it is still unclear exactly what form change would take. Today's "March of Millions" may help stoke political progress in the Middle East if it can convey a message others can understand and if it can reach large numbers of people. Regarding the latter, CNN reports that Egypt has shut down the internet, though The Guardian reports that Google and Twitter have launched a service to allow people in Egypt to send Twitter messages via voicemail. The influence of communication technologies on these developments might prove to be the biggest part of this story. And they relate in interesting ways to Kant's concern for the publicity of communication. At this stage it is unclear what direction things will go in if President Mubarak does step down. The rest of the world, along with Egypt, is anxiously watching to see how things unfold.